What I’m excited about personally: I serve on the board of Parentcamp.org because I believe in Parentcamps! They are simple in design and they build relationships and trust between our youth champions—parents, teachers, & community. It started for me with a 2014 Voxer book study of Beyond the Bake Sale which led to work on Parentcamp.org & helping schools DO parentcamps. Check out Parentcamp.org for news and history. Currently I guide schools in their first parentcamp experiences—start to finish and anything in between. I work with a growing group of people across the nation who are similarly convinced that family-school-community engagement is the key to the type of student learning and community growth we all know is possible. Watching schools “see the light” and “feel the joy” after their first parentcamp is the greatest gift because I know what can grow out of the capacity. Look for upcoming stories featured on parentcamp blog from schools around the nation about their parentcamps—the setup, experiences, and outcomes! Parentcamps are personalized family-school-community engagement events that give parents, teachers and community members CHOICE in their time, place, pace and path. Parentcamp is based on conversation and freedom to be a learner and leader. The topics at Parentcamp are specifically what families want to talk about. In Education Write Now: Top Strategies for Improving Relationships and Culture I share the steps to setting up and running a parentcamp at your school. I can’t wait to share this with you because I know the relationships you build from your very own Parentcamp will benefit your entire community in ways you can’t quite imagine — yet! When schools do one Parentcamp they can take it from there. Parent engagement is not rocket science — it’s pedagogy! 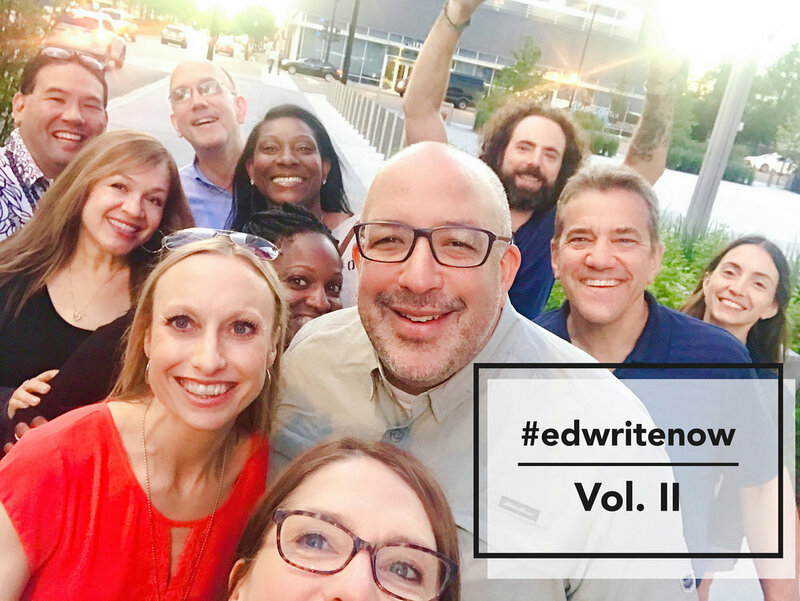 The #EdWriteNow writing experience: We are excited to share the book with the world! It comes out in December. I marvel at the collective passion, experience, positivity and leadership poured into this book. I believe it will inspire you, your colleagues and your families/communities to work together to build bridges for kids — between us all. Every author is sharing a reflection on the project and an excerpt from his/her individual chapter as we head into the book release in December. I hold much respect and admiration for Jeff Zoul and Sanee Bell, our fearless EdWriteNow leaders! I would like to thank them for this opportunity to write and share my passion with YOU. Lauren Davis, our incredible Routledge editor, is an ardent supporter and coach. Jeff Zoul kicked off our EdWriteNow experience sharing that all proceeds from book sales of each #EdWriteNow will go to the Will to Live Foundation, a non-profit foundation dedicated to preventing teen suicide. See the video, Will to Live video that we watched at the end of this blogpost. week followed by Onica L. Mayers, Winston Sakurai, Sean Gaillard and Danny Bauer! I believe that every child, school, family and community benefits from strong relationships between all sectors. Those relationships are brought to life through talking and learning together! How does a school begin to build positive relationships? Schools reach out to families and community and ask what they want to talk about. Then schools hold an event for teachers, families and community to talk about those things! By applying personalized pedagogy to family engagement you will find that doors open and new possibilities materialize because of the relationships. When you think parent-engagement or family-school-community engagement you CAN have a happy feeling. Here is a very short excerpt from my chapter. The Status Quo: Family-School engagement is difficult and feels stressful to both educators and parents. Family School Engagement is an add-on, seen as separate from the school’s identity; parents are viewed as something to manage. Schools and parents are separate from each other, interacting when they have to from their side of the gap. From the educator perspective, we know the fear of being on the receiving side of an upset parent who is swimming in emotion. From the parent perspective, we know the feeling of sting of lack of information or the feeling of perceived uncaring treatment of a child by an educator or by the system. Both sides feel unvalued and unappreciated by the other. Here is where a real relationship between parents and teachers—beyond grades, behavior and upcoming field trips—would make the difference. During my 20 years as a middle school science and social studies teacher, I knew in my heart there had to be more to “parent engagement” than Parent-Teacher Conference night, Back-to-School Night, student performance events like sports, and parent information nights. Three of the four examples above are examples of one-way communication TO or AT parents and families. Our choice of calling passive communication AT parents ‘parent engagement’ is misplaced. Choice and voice are not typically options for parents today. What causes schools to fear communicating and partnering with parents? We haven’t SEEN anything different. We’re simply doing what we grew up with. The good news: Families and schools can become JOYFUL ALLIES, working together for our kids --because we want to and because we can! Our job as educators is to move from managing parents at arms’ length to partnering and TEAMING with them as the most important figures in every child’s life. Kids spend the majority of their lives with their immediate family and with teachers. Imagine if we truly partnered and formed strong relationships with each other through conversation and mutual respect. We could be that support system for kids — growing together, creating together and most importantly, cheering on our kids together! Ill show you how to get started doing that with a simple model called Parentcamp. Thank you for making time in your life to read this post.